Today we’re going to talk about cat hashtags. Why? Because cats and humans have had a symbiotic relationship for what seems like the beginning of time. It is no surprise that cats are quite a popular subject on Instagram. As of March 2017, there are over 100 million posts tagged #cat. That means that if you are in a business that is cat related or are able to incorporate cats into your Instagram posts, you have the potential to reach a huge audience. It also means there is a lot of competition. Today, we’ll discuss how to use cat hashtags by combining them with others not just to get the most eye balls on your posts, but to get the most targeted eyes on them so you increase the chances of converting those people. 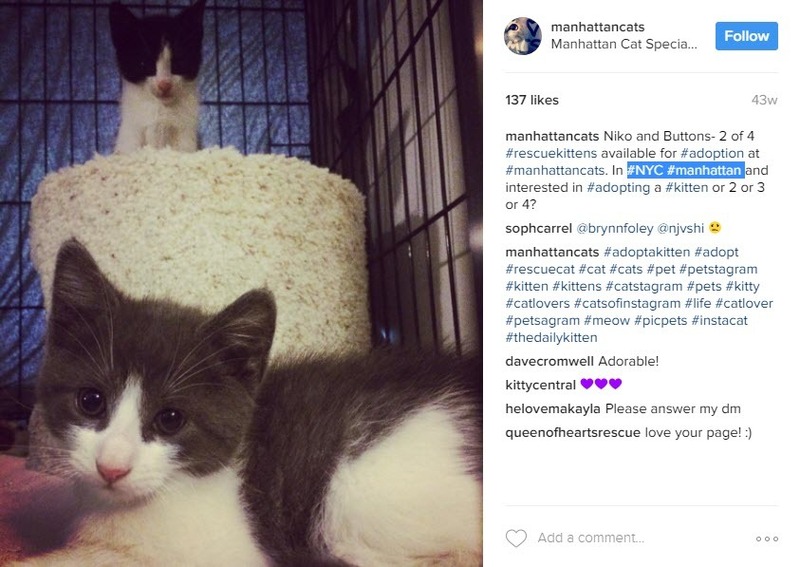 Before you keep reading, take a few seconds to copy and save the Instagram Cat Hashtags below. They will be the basis of your strategy. This technique is there to help you get more likes on your post and increase your chances of coming up in the Top Posts area. Basically, by including breed hashtags, you’re increasing your chances that the people who are looking for those particular breeds will see your image. This type of Instagram user has a much higher chance to convert to a like or comment than a more generic cat lover. 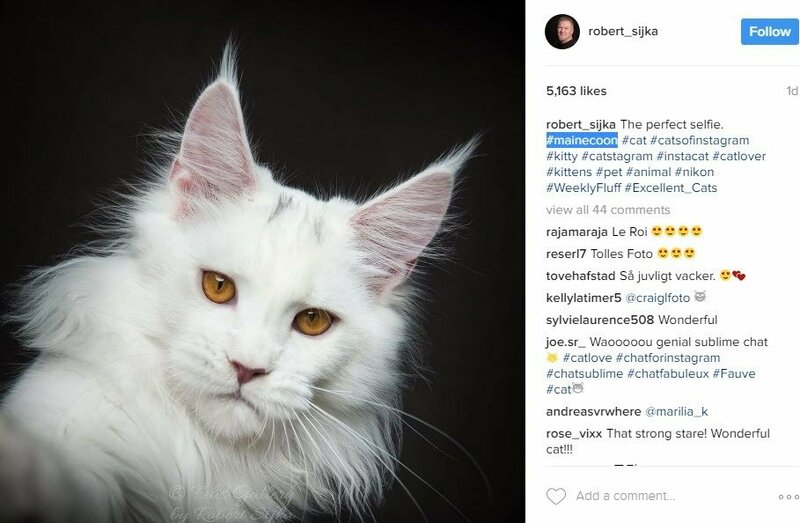 Photographer Robert Sijka not only uses cat hashtags here to appeal to a general feline loving audience, he guarantees himself maximum engagement by using breed specific cat hashtags such as #MaineCoon. It’s great to get in front of people who love cats, but what’s better is to be seen by people who can convert. Sylvain H., a veterinarian is a savvy Instagram user. 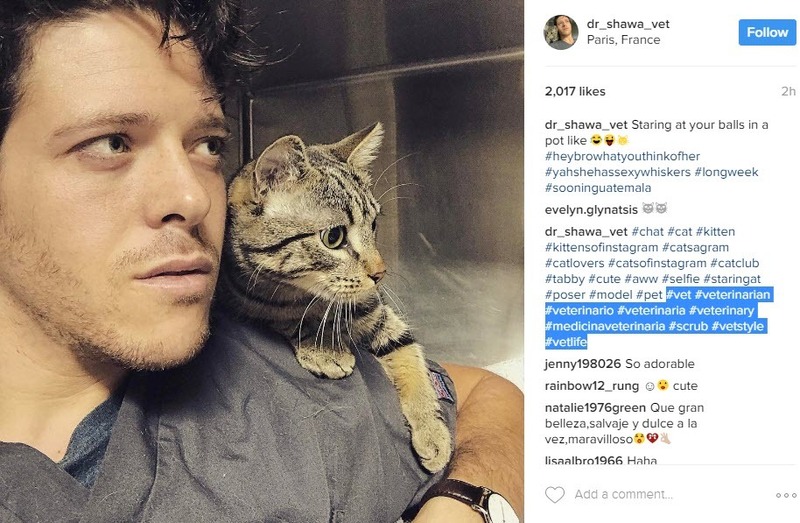 Note how he utilizes more general cat hashtags such as #cat #kitten and #catlovers, but then mixes in hashtags directly related to his industry #vet #veterinarian #vetlife. By adding these tags, he may get in front of people who are looking for a vet. If you are a photographer, you may want to include photography tags. If you are marketing a pet store, then you’ll want to add some related to that. The key here is to give yourself a chance to be seen by people who can convert. This is a technique that you’ll want to use when it makes sense. For example, designer Leona Edmiston, collaborated with Fancy Feast cat food on a promotion. It makes total sense that she used the #FancyFeast hashtag to get in front of their audience. People interested in Fancy Feast are more likely to convert and perform her requested action. Whenever you post, think about what other brands you can tag in your posts in order to reach their audience. Maybe you are just starting out, and your brand is not as popular as Petco’s, but it is a good idea for you to create a custom hashtag for your brand. When implemented properly, you can turn your customers and audience into brand advocates. Just check out how powerful that is. Petco has only created about 2,000 pieces of content, but there are more than 450,000 posts using their tag. That’s a heck of a lot of people pushing out their brand. If you need help on this, just go to our article on how to create and use branded hashtags effectively. This is specially important if you are a local brand or business (like a vet or a pet store). Manhattan Cat Specialists can’t get up and go to Los Angeles. They need to reach a local audience, an audience that can convert to paying clients. In order to reach a local audience, note how they use geo-targeted hashtags #NYC #Manhattan. Want to try it out? Take Socialdraft for a risk free trial. It’s easy.